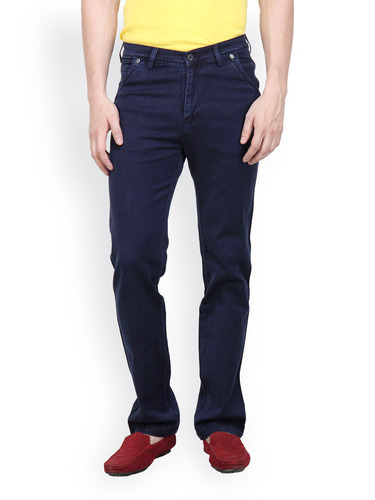 We deliver extremely high grade Men Blue Denim Jeans for our customers at economical marked price. The garments are developed using raw fabrics of premium grade as per the industrial values. These items are accessible in average sizes and provide perfect fit. It can be bought in a range of colors at cost effective rates. We use supreme grade fabric for the production process. Established in the year 1991, TNG Retail (India) Pvt. Ltd. has become a leading firm actively engaged in Manufacturing and Supplying an elegant range and a superior quality of Men Cotton Chinos Trousers, Men Denim Jeans, Men Designer Jeans, Men Slim Fit Jeans, Men Straight Fit Jeans, Poly Cotton Trouser etc. These garments are fabricated in our up-to-date production unit in compliance with current fashion by our talented designers. So as to fabricate these garments we use supreme quality fabric and other allied material, procured from genuine vendors of the industry. By using avant-garde machines and advanced techniques, our designers fabricate these garments in variety of designs, patterns, sizes and colors to cater to the varied needs of customers. Offered items are highly praised by our customers for features like beautiful design, perfect finish, smooth texture, colorfastness, skin-friendliness and perfect fitting.